Home ... The Arc Blog ... All Posts ... Programs and Supports ... Fall Is Racing Season! If you’re a runner or have any runner friends you might have heard them talk about fall being race season. To many runners, the crisp autumn weather is considered the “perfect” running weather and a lot of people head out to local parks, community centers, etc. 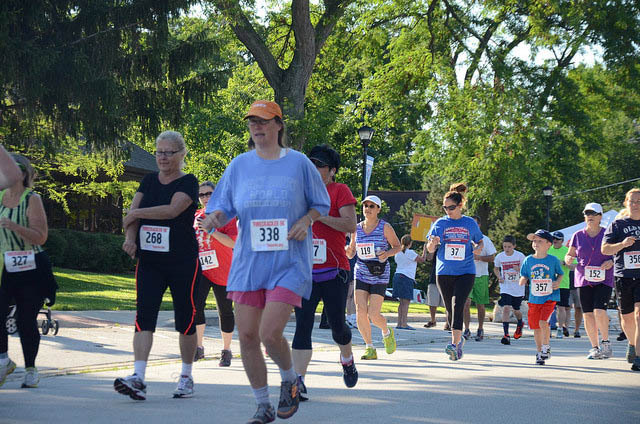 to take part in the fun of running a race – whether it’s a 5k (3.1 miles) or a marathon. CDC’s Vital Signs earlier this year sent out shocking statistics that half of all adults with disabilities get no aerobic exercise at all and are three times more likely to have heart disease, stroke and diabetes. For those that are able, running/walking is a great way to get in daily exercise without having to have a special place to go or expensive equipment to use. The only real equipment that is needed is proper shoes and comfortable workout clothing. While running may be hard for some to start off with walking can actually provide many of the same health benefits as running without all the impact that running endures on the body. Running and walking are both great cardiovascular activities that help to build muscle and endurance, make your heart stronger, and help relieve high blood pressure. They also burn calories which aid in weight loss and reducing the risk of type 2 diabetes. While running/walking is a very individualized sport that you don’t need anyone else to do it with, it can actually be a very social activity as well. A walking club is a great way to stay active and socialize with friends at the same time. All over the country are runs and walks of various distances that anyone can take part in, regardless of if they have an intellectual disability or not. Now-a-days more and more races are taking the initiative to specifically reach out to individuals with intellectual disabilities to be a part of the action. Girls on the Run (GOTR) is a 12 week running program for girls ranging from 3rd to 8th grade with the goal of finishing a sponsored 5k race at the end of the program. GOTR in Columbia has reached out to The Arc of Midlands to work with them to recruit individuals to join in one of their upcoming races. The Spartan Race is an off-road race combined with different obstacles throughout the course and has grown significantly more popular in past years. The Spartan Race has recently modified their course in certain locations to develop a Special Needs Obstacle Course so that individuals with intellectual disabilities can participate as well. Completing a race is more than just doing the miles. In addition to the many physical benefits from running or walking there is also a great sense of accomplishment and pride that comes from crossing the finish line filled with the support of spectators cheering you on. It helps to boost overall self-esteem and mood, which is what draws many people back to do another race. Many races give out shirts and some even give medals to everyone who finishes, which is a great bonus to all the hard work and training that has been accomplished. A popular fun race to do every year is a Turkey Trot on Thanksgiving Day morning. It’s a great way to get the entire family and friends out to be active and do an activity that includes individuals of all ages and fitness levels. It’s also a great way to burn some calories before that big turkey dinner later in the day! So this fall think about joining a running/walking group in your community or start one with friends and family to help increase your fitness level. To find local races in your area, check out the race calendar. Learn more ways to stay healthy and active by checking out The Arc’s HealthMeet page.